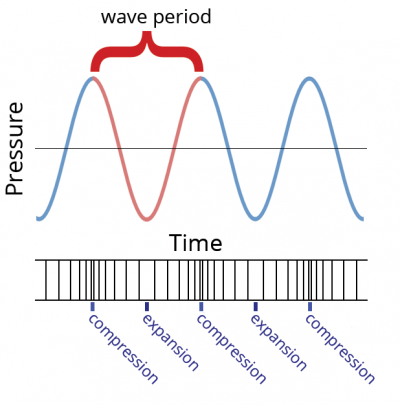 The following video shows a high frequency wave and a low frequency wave, plotted as pressure versus time. There are 15 cycles in the high frequency wave and only 3 cycles in the low frequency wave, for the same time duration. If you increase the frequency of sound (there are more cycles in a second), you get a higher pitched sound. When you decrease the frequency, you get a lower pitched sound. Listen to the difference between frequencies in the series of sounds below. A series of tones from 200Hz to 475Hz at 25Hz intervals.